Denver ADAPT activists after release from jail. July is widely celebrated as Disability Pride Month in the U.S. This year, the month marks the 27th anniversary of passage of the Americans with Disabilities Act on July 26, 1990. The ADA, a landmark U.S. civil rights bill for people with disabilities, was enhanced in 2008 by the ADAA, Americans with Disabilities Act as Amended. At least three pieces of legislation recently introduced in Congress threaten the rights and benefits of people with disabilities. The American Health Care Act, renamed the so-called “Better Care Reconciliation Act” by the Senate, would have removed millions of people from Medicaid, the health insurance of millions of people with disabilities. Most types of health insurance other than Medicaid and Medicare have lower or no benefits for psychiatric medical services when compared with non-psychiatric medical care — a very discriminatory policy. Fortunately, this death threat got a reprieve when the Senate announced it lacked the votes for passage. Two other punitive bills are currently in the House of Representatives: the ADA Education and Reform Act of 2017 (HR620) and the ADA Lawsuit Clarification Act of 2017 (HR1493). Their provisions would delay for six months the ability of wheelchair users and other people with disabilities to secure access to various services through the “reasonable accommodation protections and rights” stipulated in the ADA. Both bills would impose a 60-day period to notify an owner/operator of a problem and 120 days for them to fix it. The disabled community has responded to these attacks with resistance. In Washington, D.C., activists led by ADAPT (Americans Disabled for Accessible Public Transit) held a die-in at the office of Senate Majority Leader Mitch McConnell (R-Ky.) to protest the cuts to Medicaid on June 22. When the Senate adjourned for a recess, the activists began occupying local offices of some senators. In Colorado, at Sen. Cory Gardner’s Denver office, ADAPT activists staged a sit-in for 59 hours until they were arrested. They were finally released July 1 after an additional 30 hours in custody. 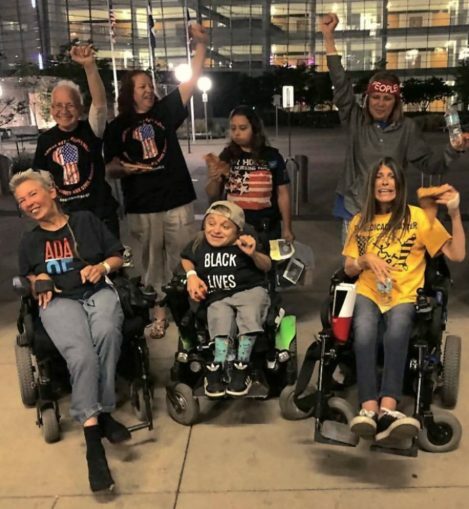 ADAPT was central to the famous 1990 “Capitol Crawl” in Washington, D.C. Over 60 activists abandoned their wheelchairs and mobility devices and began crawling up the 83 stone steps to the U.S. Capitol building entrance, as people chanted “What do we want? ADA! When do we want it? Now!” The ADA was passed later that year. Wheelchair user and labor and disability rights activist Mary P. Kaessinger told Workers World of her continuing difficulty in accessing public transportation: “I ride a scooter because of my MS [multiple sclerosis]. When using the New York City subways, one of the biggest challenges is the platform gap. Eighty percent of the time, the level of the subway car floor is 2-to-3 inches higher than the platform. “I can use the subways only because other passengers, total strangers, recognize my plight and literally lift me and my scooter into the subway car. While some of the service on the MTA buses and trains has improved over the last 20 years, the MTA still has far to go. At least the buses don’t always drive by any more and pretend they don’t see you. But as for subways, there are too few elevators, and it ought to be a priority to maintain the ones they do have. Kaessinger concluded: “We demand full access to all buildings and all modes of transportation, and that everyone — the government, Wall Street, big corporations, bosses and all individuals — respect our rights and stop messing with the ADA and threatening our fundamental right to access. We are not begging for a handout. We do not seek or appreciate pity. We are demanding our human rights. This year, a group of disability organizations and disabled residents brought class action lawsuits in state and federal court, charging that New York City’s subway system is one of the least accessible public transportation systems in the U.S. The city has the lowest accessibility rate — 24 percent — among the 10 largest transit systems. Almost three decades after the “Capitol Crawl” people with disabilities continue to have to fight to be treated with the same respect and rights as able-bodied individuals. The escalating terror and attacks in the U.S. against people of color, women, LGBTQ people and people with disabilities have been met with escalating resistance from the oppressed who plan to sweep today’s Big Lie — “lesser value” bigotry — into the dustbin of history. This month, you can join a July 9 Disability Pride parade in New York City organized by a coalition of disability rights groups. The parade gathers at Union Square at 10 a.m., with an 11 a.m. march, ride and roll up Broadway to Madison Square Park for a Disability Rights Festival from 12 noon to 3 p.m. Parades this year are also planned in other cities, including Chicago and Boston. Edward Yudelovich is a person with emotional and one-sided hearing loss disabilities.